All Vietnam Embassies and Consulates abroad need permission of Vietnam Immigration Department before issuing any Vietnam visa or the other related documents. – Permanent or temporary resident of other nationalities. There are 3 official facilities of Vietnam Immigration Department in 3 regions of Vietnam: the North, the Center and the South. Address: No 44-46 Tran Phu, Ba Dinh, Ha Noi city. Phone for support: 04 3825 7941. Address: 196 Nguyen Thi Minh Khai, Ward 6, District 3, Ho Chi Minh City. How to apply visa on arrival with the Vietnam Immigration Department? – Step 2: The documents on behalf of their customers wil be submitted to the Vietnam Immigration. 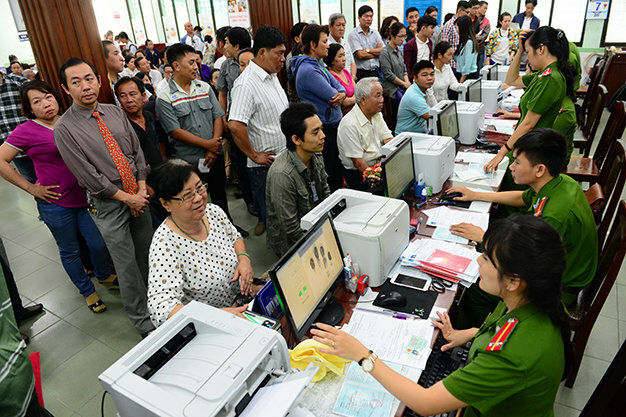 – Step 3: The customer’s data will be verified by the Vietnam Immigration Department. Once they are checked, a approval letter will be issued and returned to Vietnam visa agent. The approval letter is format in JPG or PDF and sent to the applicants via email. WORKING HOURS: Vietnam Immigration Department will start at 8:00 AM – 11:00 AM in the morning and 1:30 PM – 4:00 PM in the afternoon, from Monday through Friday, except the Vietnamese public holidays.